Algeria: Algeria ; Arabic: الجزائر‎ al-Jazā'ir, Algerian Arabic الدزاير al-dzāyīr; French: Algérie), officially the People's Democratic Republic of Algeria (Arabic: الجمهورية الجزائرية الديمقراطية الشعبية‎), is a country in the Maghreb region of North Africa. The capital and most populous city is Algiers, located in the far north of the country on the Mediterranean coast. 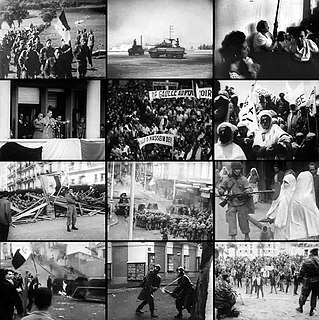 Algerian War: The Algerian War, also known as the Algerian War of Independence or the Algerian Revolution was fought between France and the Algerian National Liberation Front (French: Front de Libération Nationale – FLN) from 1954 to 1962, which led to Algeria gaining its independence from France. An important decolonization war, it was a complex conflict characterized by guerrilla warfare, maquis fighting, and the use of torture. Algerian Civil War: The Algerian Civil War was an armed conflict between the Algerian Government and various Islamic rebel groups which began in 1991 following a coup negating an Islamist electoral victory. The war began slowly as it first appeared the government had successfully crushed the Islamist movement, but armed groups emerged to fight jihad and by 1994, violence had reached such a level that it appeared the government might not be able to withstand it. 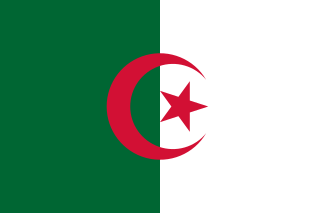 Algeria national football team: The Algeria national football team represents Algeria in association football and is controlled by the Algerian Football Federation. The team plays its home games at the Stade 5 Juillet 1962 in Algiers. Algerian Arabic: Algerian Arabic is a language derived from a variety of the Arabic language spoken in northern Algeria. It belongs to the Maghrebi Arabic language continuum and is partially mutually intelligible with Tunisian and Moroccan.